Bologna ( ; [boˈloɲːa]; Emilian: Bulåggna, [buˈlʌɲːa]; Latin: Bŏnṓnĭa) is the capital and largest city of the Emilia-Romagna Region in Northern Italy. It is the seventh most populous city in Italy, located in the heart of a metropolitan area (officially recognised by the Italian government as a città metropolitana) of about one million. Traditionally said to be founded in 1088, the University of Bologna is widely considered to be the first university. The university originated as an international centre of study of medieval Roman law under major glossators, including Irnerius. It numbered Dante, Boccaccio and Petrarca among its students. The medical school is especially famous. In the 12th century, the city's families engaged in continual internecine fighting. Troops of Pope Julius II besieged Bologna and sacked the artistic treasures of his palace. From that point on, until the 18th century, Bologna was part of the Papal States, ruled by a cardinal legato and by a Senate which every two months elected a gonfaloniere (judge), assisted by eight elder consuls. In 1530, in front of Saint Petronio Church, Charles V was crowned Holy Roman Emperor by Pope Clement VII. Bologna suffered extensive damage during World War II. The strategic importance of the city as industrial and railway hub connecting northern and central Italy made it a strategic target for the Allied forces. On 16 July 1943 a massive aerial bombardment destroyed much of the historic city centre and killed scores of people. The main railway station and adjoining areas were severely hit, and 44% of the buildings in the centre were listed as having been destroyed or severely damaged. The city was heavily bombed again on 25 September. The raids, which this time were not confined to the city centre, left 936 people dead and thousands injured. During the war, the city became a key centre of the Italian resistance movement. On 7 November 1944, a pitched battle around Porta Lame, waged by partisans of the 7th Brigade of the Gruppi d'Azione Patriottica against Fascist and Nazi occupation forces, did not succeed in triggering a general uprising, despite being one of the largest resistance-led urban conflicts in the European theatre. Resistance forces entered Bologna on the morning of 21 April 1945. By this time, the Germans had already largely left the city in the face of the Allied advance, spearheaded by Polish forces advancing from the east during the Battle of Bologna which had been fought since 9 April. First to arrive in the centre was the 87th Infantry Regiment of the Friuli Combat Group under general Arturo Scattini, who entered the centre from Porta Maggiore to the south. Since the soldiers were dressed in British outfits, they were initially thought to be part of the allied forces; when the local inhabitants heard the soldiers were speaking Italian, they poured out on to the streets to celebrate. Bologna has a humid subtropical climate (Köppen: Cfa, Trewartha: Do). The municipality of Bologna was subdivided into nine administrative Boroughs (Quartieri) until 2015. Each Borough is governed by a Council (Consiglio) and a President, elected contextually to the city Mayor. The urban organization is governed by the Italian Constitution (art. 114). The Boroughs have the power to advise the Mayor with nonbinding opinions on a large spectrum of topics (environment, construction, public health, local markets) and exercise the functions delegated to them by the City Council; in addition they are supplied with an autonomous founding in order to finance local activities. Of the nine boroughs, eight were governed by the Democratic Party and one by the Lega Nord. In July 2015 has been approved a reform to reduce the Boroughs from nine to six, as a result of the spending review to save up to 200.000 euros. 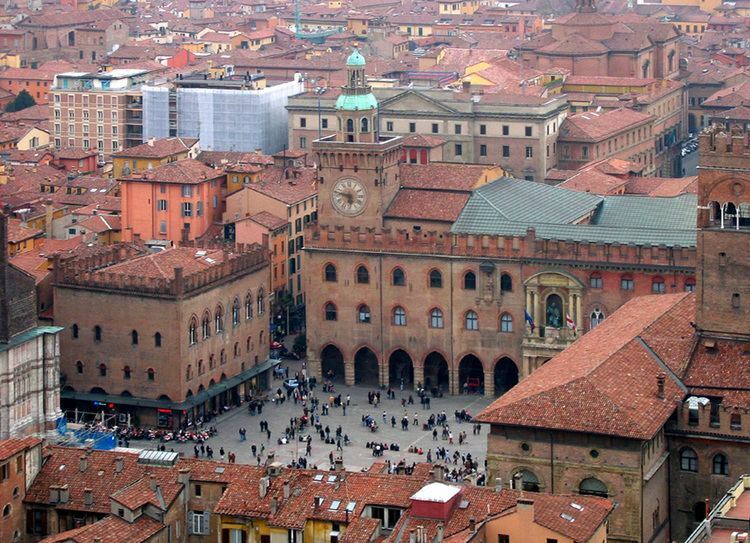 For a complete list, see Buildings and structures in Bologna. The Portico di San Luca is possibly the world's longest. It connects Porta Saragozza (one of the twelve gates of the ancient walls built in the Middle Ages, which circled a 7.5 km (4.7 mi) part of the city) with the Sanctuary of the Madonna di San Luca, a church begun in 1723 on the site of an 11th-century edifice which had already been enlarged in the 14th century, prominently located on a hill (289 metres (948 feet)) overlooking the town, which is one of Bologna's main landmarks. The winding 666 vault arcade, almost four kilometres (3,796 m or 12,454 ft) long, effectively links San Luca, as the church is commonly called, to the centre of town. Its porticos provide shelter for the traditional procession which every year since 1433 has carried a Byzantine icon of the Madonna with Child attributed to Luke the Evangelist down to the Bologna Cathedral during Ascension week. Bologna is an important railway and motorway hub in Italy. The economy of Bologna is characterized by a flourishing industrial sector, traditionally based on the transformation of agricultural and zootechnical products (Granarolo, Segafredo Zanetti). It also includes machinery (Coesia, IMA), energy (Hera Group), automotive (Ducati, Lamborghini), footwear, textile, engineering, chemical, printing and publishing industries, as well as a strong financial, insurance (Unipol) and retail (Coop Italia, Conad) activity. The city's Fiera District (exhibition centre) is one of the largest in Europe, with important yearly international expos focused on the automobile sector (Bologna Motor Show), ceramics for the building industry (International Exhibition of Ceramic Tiles and Bathroom Furnishings) and food industry. In addition, several important firms in the fields of food, tobacco and electronics have their headquarters in the urban area of Bologna, as well as important retail and wholesale trade (the "Centergross" in Argelato, esabilished in 1973), and one of the largest Italian food processing companies (Conserve Italia). Bologna is home to the Guglielmo Marconi International Airport, recently expanded to accommodate larger aircraft. Today, it is the seventh busiest Italian airport for passenger traffic (7 million passengers handled in 2016). Bologna Centrale railway station is one of the most important train hubs in Italy thanks to the city's strategic location. It serves 58 million passengers annually. In addition, Bologna San Donato classification yard, with 33 railway tracks, is the largest in Italy by size and traffic. The city is also served by a large network of public bus lines, including trolleybus lines, operated since 2012 by Trasporto Passeggeri Emilia-Romagna SpA (TPER). The average amount of time people spend commuting with public transit in Bologna, for example to and from work, on a weekday is 53 min. 9% of public transit riders, ride for more than 2 hours every day. The average amount of time people wait at a stop or station for public transit is 12 min, while 16% of riders wait for over 20 minutes on average every day. The average distance people usually ride in a single trip with public transit is 5.4 km, while 7% travel for over 12 km in a single direction. The University of Bologna, founded in 1088, is the oldest university in the world, and was an important centre of European intellectual life during the Middle Ages, attracting scholars from Italy and throughout Europe. A unique heritage of medieval art, exemplified by the illuminated manuscripts and jurists' tombs produced in the city from the 13th to the 15th centuries, provides a cultural backdrop to the renown of the medieval institution. The Studium, as it was originally known, began as a loosely organized teaching system with each master collecting fees from students on an individual basis. The location of the early University was thus spread throughout the city, with various colleges being founded to support students of a specific nationality. In the Napoleonic era, the headquarters of the university were moved to their present location on Via Zamboni (formerly Via San Donato), in the north-eastern sector of the city centre. Today, the University's 11 schools, 33 departments, and 93 libraries are spread across the city and include four subsidiary campuses in nearby Cesena, Forlì, Ravenna, and Rimini. Noteworthy students present at the university in centuries past included Dante, Petrarch, Thomas Becket, Pope Nicholas V, Erasmus of Rotterdam, Peter Martyr Vermigli, and Copernicus. Laura Bassi, appointed in 1732, became the first woman to officially teach at a college in Europe. In more recent history, Luigi Galvani, the discoverer of biological electricity, and Guglielmo Marconi, the pioneer of radio technology, also worked at the University. The University of Bologna remains one of the most respected and dynamic post-secondary educational institutions in Italy. 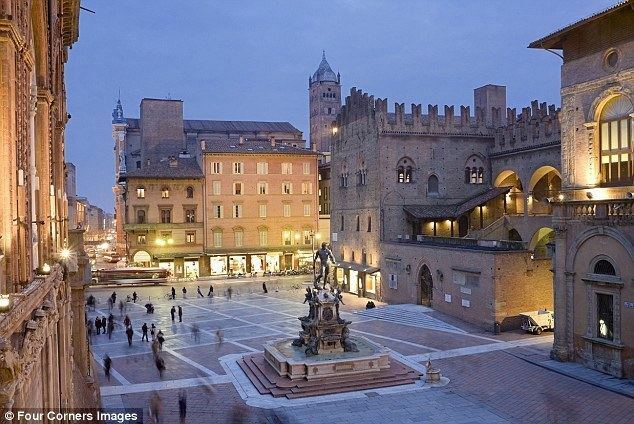 To this day, Bologna is still very much a university town, and the city's population swells from 400,000 to over 500,000 whenever classes are in session. This community includes a great number of Erasmus, Socrates, and overseas students. Bologna is also home to other universities such as the Bologna Center of Johns Hopkins University School of Advanced International Studies (SAIS). SAIS Bologna was founded in 1955 as the first campus of a US post-graduate school to open in Europe. It was inspired by Marshall Plan efforts to build a cultural bridge between America and Europe. Today, the Bologna Center also hosts the Associazione italo-americana "Luciano Finelli," which supports cross-cultural awareness and exchange between Italy and the United States. In the city are present several high schools and institutes superiors, both public and independent schools. The city of Bologna was appointed a UNESCO City of Music on 26 May 2006. According to UNESCO, "As the first Italian city to be appointed to the Network, Bologna has demonstrated a rich musical tradition that is continuing to evolve as a vibrant factor of contemporary life and creation. It has also shown a strong commitment to promoting music as an important vehicle for inclusion in the fight against racism and in an effort to encourage economic and social development. 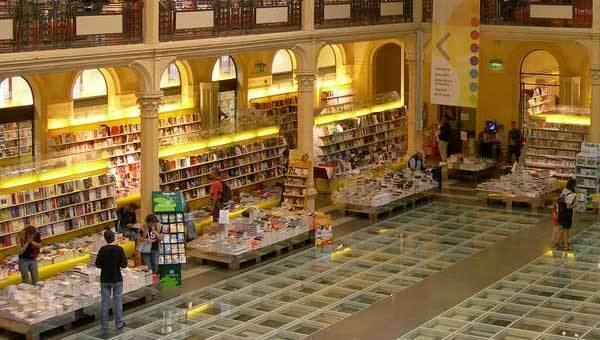 Fostering a wide range of genres from classical to electronic, jazz, folk and opera, Bologna offers its citizens a musical vitality that deeply infiltrates the city's professional, academic, social and cultural facets." Bologna is renowned for its culinary tradition. It has given its name to the well-known Bolognese sauce, a meat based pasta sauce called in Italy ragù alla bolognese but in the city itself just ragù as in Tagliatelle al ragù. Situated in the fertile Po River Valley, the rich local cuisine depends heavily on meats and cheeses. As in all of Emilia-Romagna, the production of cured pork meats such as prosciutto, mortadella and salumi is an important part of the local food industry. Well-regarded nearby vineyards include Pignoletto dei Colli Bolognesi, Lambrusco di Modena and Sangiovese di Romagna. Tagliatelle with ragù, lasagne, tortellini served in broth, and mortadella, the original Bologna sausage, are among the local specialties. Traditional Bolognese desserts are often linked to holidays, such as fave dei morti, multi-coloured almond paste cookies made for All Saints' Day, jam-filled raviole cookies that are served on Saint Joseph's Day, and carnival sweets known as sfrappole, a light and delicate fried pastry topped with powder sugar. Torta di riso, a custard-like cake made of almonds, rice and amaretto, is made throughout the year.